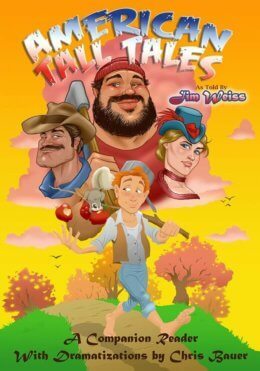 Ride across Texas on a mountain lion with Pecos Bill, work up a giant appetite with the mighty lumberjack Paul Bunyan, spread happiness with Johnny Appleseed, and confront the Fastest Draw in the West! Read these wild tales–and then act them out yourself! This beautifully illustrated Companion Reader is an exact transcript of Jim Weiss’s award-winning storytelling performance of three classic American stories and one original tall tale, available on MP3 and audio CD from Well-Trained Mind Press. The Reader can be enjoyed on its own, or used along with the recorded performance to build strong language skills. Listen to the Jim Weiss stories, read along to improve fluency, vocabulary, and grammar, and then speak great words and sentences out loud by practicing and performing the short, accessible dramatic versions of Jim’s performances (including a stage play, a puppet show, and a dramatic monologue). Choose from PDF or paperback versions. Jim Weiss’s storytelling recordings have received the highest awards from the Parents’ Choice Foundation, Oppenheim Toy Portfolio, The Film Advisory Board, and The American Library Association, and have been widely praised in major publications across North America and internationally. He has captivated and delighted child and adult audiences with his original stories and his retellings of ancient and modern classics. For additional titles, see our Jim Weiss page performance availability and distribution information, please visit www.jimweiss.com. Chris Bauer is a writer and actor based in Chicago. He received his BA in Drama from the University of Virginia in 2014, and since then has been acting and writing in Virginia, New York, and Chicago, doing film and theater for both children and adults. He is currently studying acting and writing at the Second City.